Get a preview here as P4P King Vasiliy Lomachenko takes on Anthony Crolla on ESPN+. Friday night is a chance to see the best in the world when Vasiliy Lomachenko (12-1; 9 KO) defends his WBA, WBO, and Ring Lightweight (135 lbs.) titles against Anthony Crolla (34-6-3; 13 KO). The show takes place this Friday, April 12 and airs live on ESPN+ with a fight time of 11:00 p.m. ET / 8:00 p.m. PT. 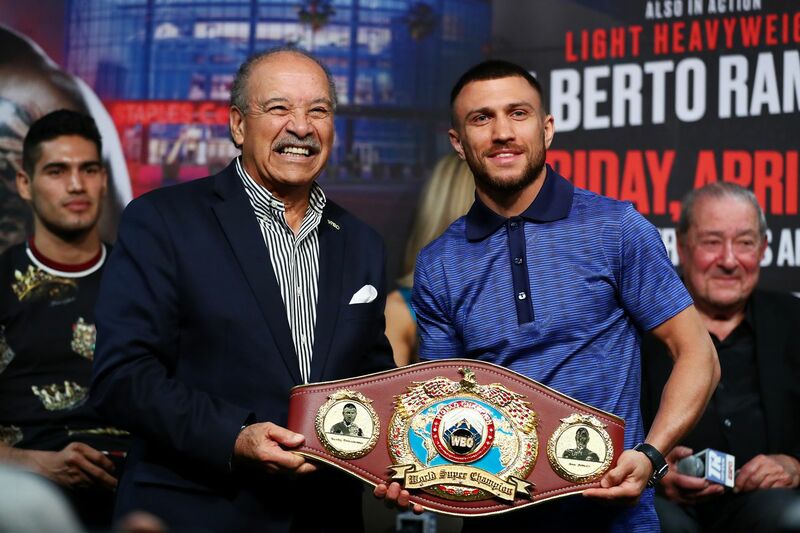 Pound for Pound best - The absolutely phenomenal Lomachenko is the champion at Lightweight, and also the #1 king of the pound for pound rankings, at least according to Ring Magazine. There’s maybe a case for Crawford or, on the outside, Usyk, but realistically, it’s Lomachenko. Is lightweight too far? - In 2018 he made the move up to Lightweight and is 2-0 since. But both went the distance, and one (his Lightweight debut against Jorge Linares) saw Lomachenko hit the mat for the first time. He’s still won and won impressively. But much like GGG in his last few fights, these lightweight fights just feel like things are a tiny bit less polished for Loma. Technique - For those who might perhaps wonder why a 12-1 fighter is ranked #1 in the world (and why he was in the discussion when he still had a single digit number of fights), you only need to watch him fight. His technical acumen is simply unparalleled. He can use angles flawlessly, applies surprising power, and completely befuddles opponents. So much so, that before his lightweight run, he saw 4 straight opponents quit on the stool. Mikey Garcia? - For some time, there was talk amongst a certain set of fans of a Lomachenko vs. Guillermo Rigondeaux technician’s dream match. That happened, and Loma smoked him. Now the big talk for some time has been Loma vs. Mikey Garcia. Maybe that talk is cooled now that Garcia has suffered his first career loss against Errol Spence, but maybe it’s also hotter since that Spence vs. Garcia fight did surprising PPV business. For it to happen, we’ll need to cross the Top Rank/PBC barrier - easier said than done. #4 Lightweight contender - Ring has Crolla as the division’s #4 contender behind Garcia, Richard Commey, and Robert Easter. Top 5 is good, but to be frank, it’s not an especially deep division, and doesn’t carry the same weight as being #4 at Welterweight for example. 3 fight win streak - Crolla comes in on a 3 fight streak, including a good win over former champ Ricky Burns. His most recent win came in November and was decent enough. Linares losses - Before these 3 wins, Crolla had back to back decision losses to Jorge Linares. At that time, Loma wasn’t a lightweight, and Linares was arguably the division’s best, so no big shame in losing to him. But since, Linares has lost to Loma, then been shockingly blown out by Pablo Cesar Cano. Those make Crolla’s losses here look worse in retrospect. US Debut - Crolla has one fight in Ireland, one in Germany, and the rest of his career has been in his native England. How will he cope with being on the road in front of US audiences for the first time? Gilberto Ramirez (39-0; 25 KO) vs. Tommy Karpency (29-6-1; 18 KO) - Classic boxing match-making here with the undefeated 27 year old Ramirez against the more battle-tested Karpency. Top Rank clearly has plans in store for Ramirez, who continues to pick up steam. Karpency is a name opponent who does have a win over Chad Dawson, but is otherwise known as a name in the win column for the likes of Adonis Stevenson, Gvozdyk, and more. He shouldn’t be much of a challenge here. Neither of these fights are too close, but Lomachenko remains arguably the sport’s #1 must-watch fighter. I’m in, even if I don’t anticipate too much drama.